When I started running I could only run two blocks and even that was pushing my limits. Fortunately I decided to stick with it. I kept running and I started to improve. After a few months of running, I finally signed up for my first 5K. When I crossed that first finish line, I was hooked. At no other time in my adult life had I felt such an amazing sense of accomplishment. 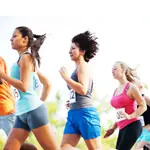 If you are considering running a 5K, but you haven't run before or you are a runner trying to get back into a rhythm, here are some tips to help you reach your goal. The big way to get motivated to run is to officially throw your hat into the ring. Pick a race and sign up. Having an actual goal and date to work toward will help you focus and commit to your training. If you are truly a new runner, make sure the race is at least eight weeks away to give yourself plenty of time to build up your running distance slowly. If you're into gear, then you can look into a sports watch as it will help you know your mileage and, depending on the model, your speed. There are also plenty of apps on the market now that can turn your phone into a sports watch of sorts. Shop around for an app that match your running goals the best. You can also look into the higher end running clothes, but they are not necessary at the 5K distance. These clothes can include a technical tee, which is a T-shirt that wicks sweat away from your body, special wicking socks, or running shorts/pants. Some people like the gear as it makes them feel empowered while others are content with their T-shirts and shorts already in their wardrobe. The choice is up to you.